Is “Harry Potter: Hogwarts Mystery” the Game We’ve Been Waiting For? A few days ago, the Harry Potter: Hogwarts Mystery mobile game was released. Fans spent months counting down the days until the game was finally released. I was very excited when the game came out and immediately downloaded it and started playing. After a few minutes, I started to get the feeling that this is not the game that we’ve all been waiting for. I was pretty excited for the Sorting Ceremony. I love taking House quizzes even though I only ever get Slytherin. It was announced a few months ago that you would get to choose your House, but even after knowing this, it was still a little disappointing. Where is the fun in just picking a House? I really wish that they would have done something special for the Sorting. So about ten minutes into this game, I realized that I’d played this game before. In 2014, Kim Kardashian: Hollywood was released and quickly became one of the most popular mobile games of that year. I was obsessed and spent a better part of my senior year of college playing it. Harry Potter: Hogwarts Mystery is almost exactly the same game but with a different setting and storyline. I’m a little disappointed that there was all of this hype over something that basically already existed. I have very mixed feelings about Rowan, a character who presents as the same gender as your character. Rowan as a person seems lovely. I feel a deep need to protect them, but I also spend some time wondering how exactly they got into Slytherin. I searched around on the Internet to find out if Rowan is always a Slytherin. I discovered that Rowan will show up in whichever House you choose to be in, which in this case makes sense but does not make much sense when we talk about the next character. Merula is sort of the villain in this story. She bullies Rowan at the beginning of the game and then fights with your character. She is sort of the Draco Malfoy of the story. I was a little confused as to why a fellow Slytherin was bullying another Slytherin in public. According to Pottermore, Slytherins kept their internal conflicts from reaching the rest of Hogwarts. They try to present a united front to the rest of the school. Then, after I found out that Rowan switches Houses, I figured that Merula does as well. This is not true. 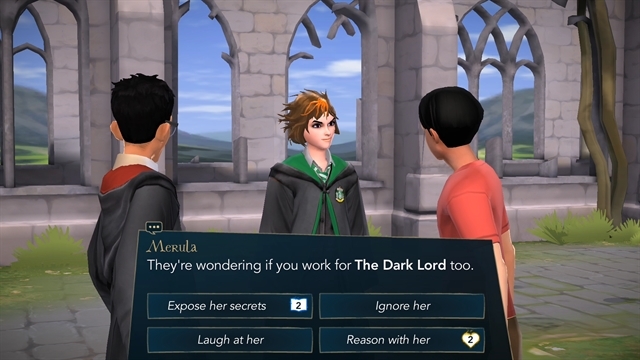 In every game, Merula is a Slytherin. I am not a huge fan of that. It would make a lot more sense if she changed Houses depending on which House your character is in. Why can’t the bully of the game be in Gryffindor? Why do Slytherins always appear as the villains? Can’t we get one thing that doesn’t have House conflicts? 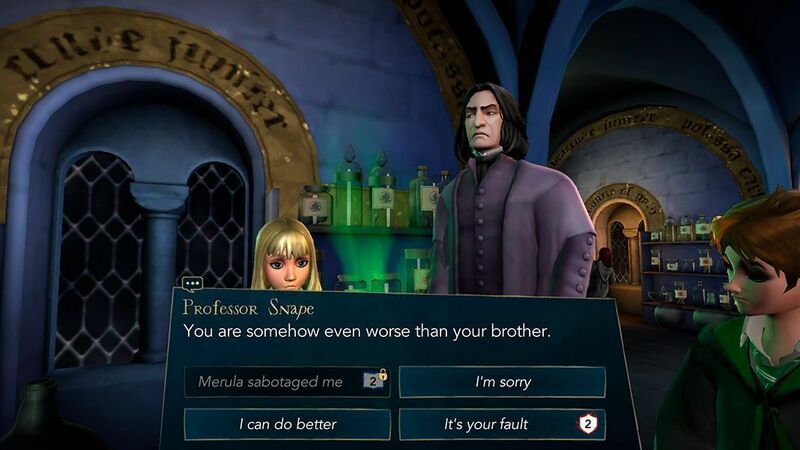 I was very confused at Professor Snape’s attitude toward my character in the game. Where was this famous favoritism that I heard so much about? I really dislike that they do not alter the game based on which House you’re in. Things like being in classes surrounded by Gryffindors and being forced to befriend Ben, who is a Gryffindor, really just take the magic out of the game for me. I can’t really get into it because it is so unrealistic for Slytherins to run around and do these things like this. Personally, I feel like we Slytherins got the short end of the stick in this game. I plan to keep playing for a little bit to see if any of my reactions change, but right now, I’m just super disappointed, and apparently, I’m not the only one. I feel like they have made this game so time-consuming to make money. How do you feel about this game? Do you feel like it has quality content? Should it have been called Hogwarts: A Mystery instead? Let us know in the comments! Five Things That “Cursed Child” Did Right! Review & Giveaway: Harry Potter by Danielle Nicole! December 24, 2005 – It is announced that a plaque will be placed at J.K. Rowling’s former writing spot.